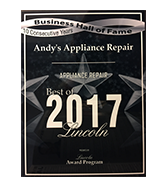 Andy’s Appliance Repair has been providing quality residential appliance repair to the Lincoln and Omaha regions for over fifty years. It isn’t any fluke that our third-generation and locally-owned company has stayed in business this long. One of our chief values has been to do right by the customer, every time. That can look like a lot of different things, depending on the situation. For some, it’s as simple as being punctual to the scheduled appointment so our customers can get back to their daily lives. For others, quality customer service is about being an appliance repair service industry that gives fair and honest quotes. If you are concerned about washer and dryer repair vs. replacement, you can trust us that we will do right by you. We aren’t in this business to make a quick buck; we are here in Omaha and Lincoln for the long haul. 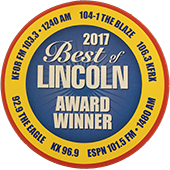 We at Andy’s Appliance Repair are very proud to inform our readers that we have been recognized in the Nebraska community for our exceptional and affordable appliance repair. We have received the Omaha Magazine’s “Best of Omaha” award in 2014. In 2013, we received Angie’s List’s Super Service Award. Also in 2013, we won the “Best of Lincoln” service award, an honor that started back in 1985. In today’s post, we will be looking at a few of these Nebraska community awards in greater detail, in addition to talking about what kind of appliance repair we provide Omaha and Nebraska with. So you may be asking yourself, who is this Angie and why is her list so special? We are glad you asked. Each year Angie’s List gives out the Super Service Award to the very top A-rated companies in given categories, within every business’ respective market. What makes the award unique is that the winners are based on customer reviews, so the public determines the outcome. 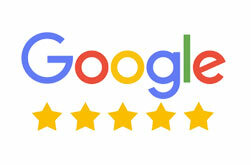 Your Angie’s List reviews determine which companies provide exceptional customer service. In the case of appliance service and repair, Andy’s Appliance Repair is at the top or thereabouts, and in 2013, we took home first place. So keep the good reviews coming, because we are ever committed to outstanding customer service and excellence in all that we do. We were honored to receive the Best of Omaha award in 2014, from Omaha Magazine. Much like Angie’s List’s Super Service competition, the outcome is based on votes. In this case, the public must email in their ballot. With just under 30,000 unique businesses and 310 categories in the Omaha metropolitan area, only 3.3 percent of qualifying businesses win the Best of Omaha each year. 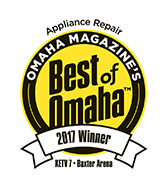 The public in Omaha uses the awards to help them decide where to shop, eat, and in this instance, get quality appliance repair service. 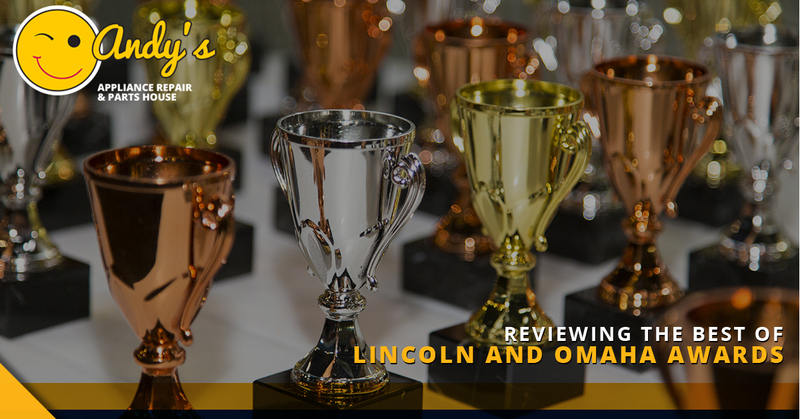 Also in 2013, we are proud to have received the Best of Lincoln award. The Best of Lincoln competition has been known as “the people’s choice” award from its onset in 1985. Every year KFOR, KFRX, KZKX, KTGL, KIBZ, and KLMS use Spartan Polling, an internet-focused consumer opinion market research firm, to conduct the survey. We received first place in 2013 in the category of Appliance Repair. One of our areas of focus has been to provide exceptional kitchen appliance repair. This includes refrigerator repair service, cooker repairs, dishwasher repairs, freezer repairs, and even ice maker repairs, it’s easy to see why the public has consistently responded to our excellent service and reliable technicians for residential appliance repair. Contact us today for award-winning appliance repair service for your home. We would love to hear from you!